St Augustine College is working on marine litter, microplastics, litter during village festivals, and recycling. Students are working on videos to help spread awareness and encourage people to litter less. An open day was held at the school where all parents were invited to the various activities in the school, and litter less was one of them. They exhibited their work (in progress) and spoke to parents about the issue. During Science in the City students also took feedback from the general public by asking what their contribution was towards reducing litter and they will be including all in their videos. Students of the Public School of Sierra Nevada have begun an investigation to save the Monachil River. 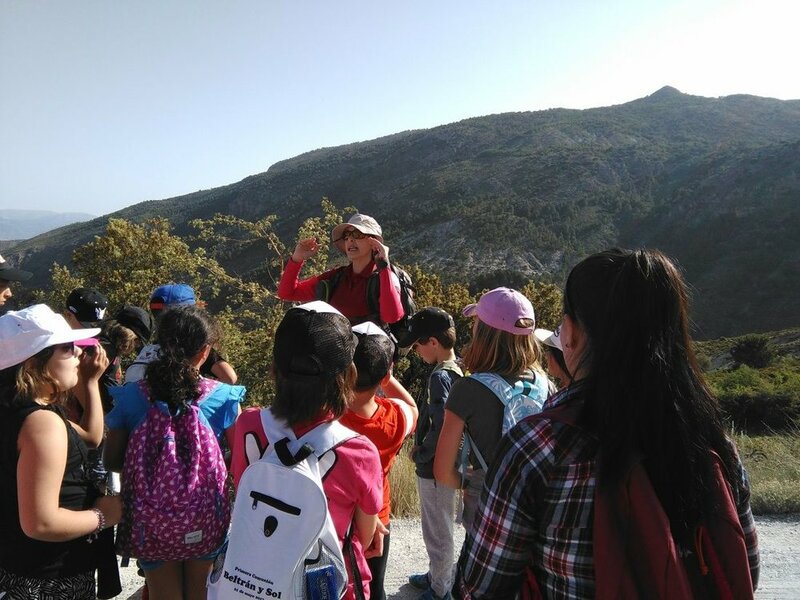 The students of the CEIP Ski-School of Sierra Nevada have started a research process to determine the state of the Monachil River and the prevalence of the ski station in the quality of its waters and surrounding life. The young reporters, along with their teachers, have also had the collaboration of the Department of Environment of the City of Monachil, which has provided materials and invited a biologist to talkd about the river. The conclusions of this study will be presented in May. One school designed the campaign so that they carried it out on the following days: December 19, 20 and 22. First day: They held a Barter Market where students exchanged objects they did not need, a complimentary coin of their own was used. Second day: The Christmas Market: They were selling gifts made with recycled materials. Third day: They held workshops on recycling, reduction, and reuse. They taught how to properly separate waste for the youngest students. They held awareness talks and a waste reuse workshop. Ulidia Integrated College from Northern Ireland Focuses on Plastic Oceans. Ulidia Integrated College, Carrickfergus, who won a YRE International Collaboration prize last year are focusing on plastic litter in the ocean this year. They are working again with Lycee Pole School in Madagascar. Both schools are situated near the coast and the issue of plastic in the oceans has a local as well as global resonance. To date the Ulidia eco team have researched plastic ocean waste and watched 'Message in the Waves' a documentary which is based on plastic waste in Hawaii. The eco team watched the BBC’s ‘Blue Planet II” which had a fantastic episode about plastic pollution at the end of the series. The eco team have arranged a joint coastal litter picking event for January 2018 with a local primary school which will coincide with a similar pick in Madagascar in the same week. The results from the picks will then be compared and contrasted using numeracy skills in February. The eco team have been enjoying incorporating YRE into Media Studies and English lessons to further develop their skills base. food waste. However this is simply managing the symptoms of our litter problem, not the cause. Our school has an over-reliance on non recyclable food packaging and does not have the knowledge to properly dispose of it. This is apparent after seeing poorly separated, overflowing green and black bins. This behaviour is unsustainable and prompted us to find a solution to our packaging problem. Within our group we borrowed inspiration from the ‘YRE Litter Less’ competition and a litter free lunch competition we entered while at an eco conference. In short, we decided to begin a litter free lunch campaign of our own. The idea is to encourage students to bring in litter free lunches and by doing this take a moment to think about the environmental impact that their actions have on our planet as a whole. We have chosen the first year students as our focus group. In this way they will hopefully carry this new knowledge with them throughout their years in Coláiste Íosagáin. We planned an action week from the thirteenth to the sixteenth of March and began to spread the information among the first year students. Before the project a delegate from the Green Committee took time to visit each of the first year classes to explain the project to them. During this time we explained the competition. Each day during the following week a delegate visits their class to track how many people participated by bringing in ‘litter free lunches.’ We defined a litter free lunch, as a lunch that was free from non recyclable waste, with an exception made for biodegradable food waste (for example apple cores). These numbers were then be totalled to see which class made the biggest effort to be litter free. This class will be given a prize. Participation was voluntary of course, but we felt the inclusion of a prize would be a reasonable incentive. After the four days we collected our results. Class A brought in 25 ‘litter free lunches’ throughout the week with an average 6.25 litter free lunches per day. Class B brought in 19 ‘litter free lunches’ throughout the week, averaging at 4.75 per day, and Class C brought in 22 ‘litter free lunches’ throughout three days, averaging at 7.3 litter free lunches per day. As Class C missed a day, a direct comparison is not possible. However if we only count the first three days. Class A and Class C are thus tied for totals and averages. While these numbers are small, they carry a hopeful message. They show the interest that people have in taking small steps towards a greener lifestyle. Although not everyone participated, everyone gained a new insight into how small actions can have big consequences both positive and negative. In future we hope to spread this project to a larger group of students in the school. To raise awareness of this issue we have used social media (the school’s twitter account) to show the efforts that students made to contribute to our litter free lunch campaign. Currently we are contacting both The Dundrum Gazette and Raidio na Life to spread awareness amongst a wider audience. However while the results of our project may not yet have saved the earth, they are definitely a start and show encouraging signs for a litter free future in our school! With these facts in mind, we started thinking about how, we, at Ballinteer Community School could make a difference. It’s not like we are new to working to combat litter and waste. Our school has only recently received its first Green Flag. The more we thought about it, the more we realised that any project we carried out would have to have two aspects – one for our school and one for our community. We set about researching two litter problems - one internal to our school as well as one external our school. First of all, we looked at making contact with Broadford Area Residents Association as the estate is right beside us but then we discovered that they were only recently the overall winner in Tidy Districts Competition in 2015. 3. On the basis of ‘If it ain’t broke, don’t fix it” we looked to the other side of the school and discovered that Hillview estate might be an area that could do with a helping hand. And this was indeed the case, as we discovered when we met up with Katie Foy (community worker) and Pat Graydon (member of the Estate Management Forum). They said that Hillview had been “the most improved estate” the previous year but that there was still a lot of work to do. They explained that the main causes of the problem were the social deprivation in the area, the lack of bins at the lower end of the estate and the fact that a high percentage of the residents are teenagers, some of whom tend to be less conscientious when it comes to disposing of their litter. Having said all that, they also said that much of the litter comes from people using the area as a ‘through-way’ to get to other destinations. They told us that the litter problem is at its worst after big occasions like Christmas, Halloween and New Year’s. Even factors like windy days can add to the problem as bins are knocked over. Although there is a monthly general tidy-up on the last Saturday of every month, residents say the problem persists. We could see from our research that we had our work cut out for us. As a result, with the help of the Hillview Resource Centre we organised a clean-up day for Tuesday 21st March 2017. Twenty BCS students visited the Hillview estate from 9:00 am until midday, armed with gloves, litter-pickers and DLRCoCo refuse sacks. We made a bee-line for the litter hotspots such as cul-de-sacs, the playing fields and the fences that catch all the rubbish blown to the bottom end of the estate. We even recovered a broken bicycle seat and half a football boot from the bushes nearby! In all we filled approx. 17 sacks of mixed refuse, which we parked in two different locations for collection (as identified by Martin, the caretaker). Many students also spoke with interested local residents about the need to take pride in one’s area. We then turned our attention towards the litter problem in our own school. Audits had been completed in the recent past for our Green Schools bid and recycle bins had been placed in every classroom as well as the General Purpose Area. However, problems persisted, especially in the GPA. We decided to interview the caretaker, Mr Hughes, to find out his thoughts on the issue and how the situation could be improved. He told us that although the GPA has a wide variety of bins for different types of waste, the students were simply not using them because they were neither ‘motivated’ nor ‘inspired’ to use them. We thought about this and agreed that what we needed was something ‘urban’, something that would ‘capture the imagination’ and one of our team hit upon it: Dunk da Junk. The concept was simple: it is common to see students in schools testing their sporting skills by ‘dunking’ waste paper in classroom bins. Why not extend this to a larger bin, designed to look like a basketball hoop, net and back-board? Plans were drawn up by some of our handy Transition Year students, and, with a little help from our metalwork and woodwork teachers we fashioned a bin that turned our vision into a reality. And it’s been successful. Since it has been installed in the GPA our caretakers Don, Yong and Carmel have seen an estimated 30% decrease in litter at morning and lunch breaks. We have now publicised our project across a variety different media platforms – our school Facebook account 4, our school Twitter account 5 and the Dundrum Gazette 6. So far, we have received positive responses and even some enquiries. To conclude, this project has increased our awareness of the problem of littering in our locality. We realise that although clean-ups improve the situation, it is best to tackle the problem through prevention at source, by attempting to change the thoughts and habits of both residents and students. If residents and students take pride in their areas, then the problem of litter will solve itself – not just in Ballinteer but across the globe. All the stages of the campaign were very interesting and stimulating, but the most memorable moment was the dissemination of the campaign’s products towards the children's parents and representatives of the local community. Each of the participants presented his product to the audience, he/she explained how he/she made it and on what purpose. The students were very enthusiastic in teaching their parents the lesson of saving nature by collecting waste material selectively and presenting them the real damage caused to the environment by careless people. They showed to the audience the results of their investigation and the solutions they proposed. The photos, models, clothes made from waste material and articles were very appreciated by the parents and the representatives of the local community and the children were very proud of their work. The dissemination of the Litter Less Campaign took place in the school and in the local community on 28th of March 2017. The activity was held in the school's festivity hall. All the 53 students involved, organized in 17 teams, the 3 coordinators, the school principal, the teachers, parents, as well as pupils from other classes that were interested in the project, participated in the community action day. The Litter Less Project 2016-2017 was presented, the school that are involved, the national coordinator, the steps taken in the project implementation, the selection of students, designating the teams, the materials made by all the 17 groups of students and also Power Point presentations. The activity was made by organizing an exhibition with all the photos captured by students following their own investigations; Each team, through their representatives, presented their own environmental investigations, with the negative issues that were identified in our community, with the solutions they proposed in their own journalistic studies (articles); All products closely followed the theme of Litter Less; Pupils answered the questions of the other participants in the activity; At the same time, the video slideshow of the photos and the videos made by the students were presented at the video projector. The sources where the dissemination took place were presented, but also the methods in which all the materials were made were brought to the attention of the school, local and national community. The Young reporters from Gymnázium Školská organized their first Community Action Day on April 26, 2017. They focused on the youngest ones: children from three kindergartens and three elementary schools took part. First, YRE program was introduced, then pupils tried sorting out the waste properly. Kids also became familiar with the story of a beverage can. Finally, old beverage cans were used to make a memorial objedct. Part of the students worked in the schoolyard. They cleaned it from artificial and biological waste. Another group of students created an artistic work from used yogurt caps. As a result, a nice image of a fish floating between the corals has been created. The whole day was shot by the camera that was purchased for this purpose. The video made by a YR Adriána Henčeková has been accepted by the regional TV Reduta http://www.snv.sk/archiv/?video=170509-4.